The care and feeding of the library’s public printers takes a lot of our time, both in the library and in ITS. We have a special load-balancing set-up designed to keep individual printers from melting or going up in smoke. We have students who devote the bulk of their time to watching over the printers and emptying case after case of paper into them. A good portion of the meetings I attend and lead have printing somewhere on the agenda. Basically, printing is a big deal. And now there are graphs to prove it. There’s a lot of extraneous information in that chart for my purposes since it’s lifted from another report on Fall term printing. But I think the GIGANTIC MOUNTAIN OF PRINTED SHEETS in the middle pretty much speaks for itself. 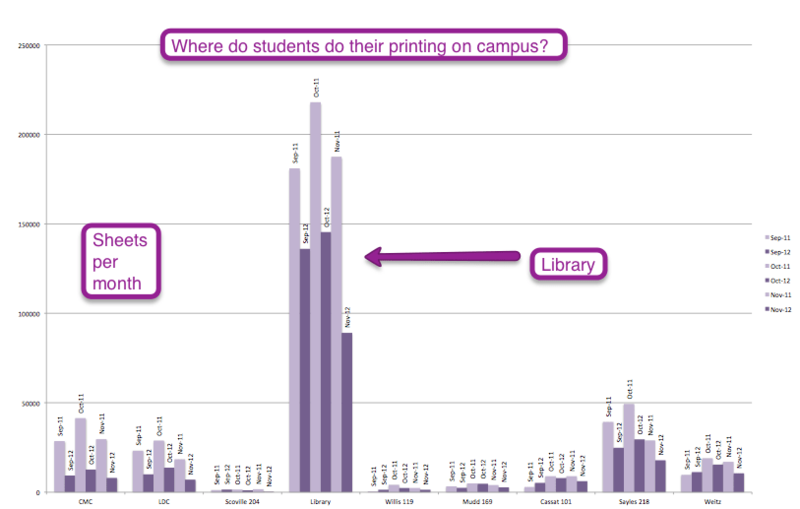 At Baruch College, we’ve found that the majority of printing is done in the library despite the fact that there are other computer labs scattered across campus. Most of the paper printed n the school where I am the librarian comes through my library printer. It is astounding how often I or some students have to put in more paper or replace the toner. Thankfully more teachers are realizing that in some cases (not all) it makes sense for them to ask students to email them their documents or upload them to classroom moodles. The killer for my printers, which are getting rather old and require a lot of buffering time for large documents, is the practice of printing out power point presentations. I finally taught students how to just print out the thumbprint versions. Stephen, yeah, those other tiny little mounds on the graph are the other labs on campus. They include the main computer labs in the IT building, the student center, the language center, and even a couple of dorms. Heather, all of our printers and their supplies come from IT, which makes it so that this isn’t a huge hardship for the library. Or rather, it takes a lot of managing, but it’s not our budget and if things go boom we can call in IT. Is that the way things are for you? If not, I could see this kind of data being either really useful in making claims about resource needs or really really frustrating if those claims fall on dead ears. There is another important message which is included in that chart. The amount of printing is down for 2011 v. same month 2012. As a manager, I would be tempted to look at that data over a longer time period to see if it is a trend. Michael, that’s actually more what the original report was about. You see, this year we instituted printing quotas. So this is the first indication that at the very lease, the initial scare of having a quota had a real impact. We’ll be watching to see if this is a new realistic number or just the initial scare number.